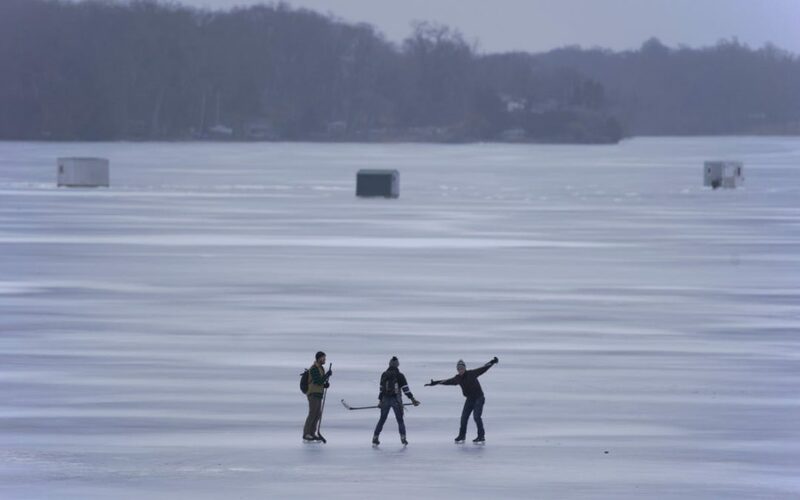 Skaters are taking advantage of Lake Minnetonka’s unusually smooth ice. People are skating from city to city across Lake Minnetonka to eat lunch, grab a beer — or just because they can. This winter’s wacky combination of mild and snow-free days has left a glassy surface on many of the area’s frozen lakes. That includes Lake Minnetonka, the metro’s largest and busiest, where skaters have been gliding around Big Island and Enchanted Island, playing hockey, riding iceboats, landing planes, even taking a spin on a tractor-pulled couch. “It’s like nothing I’ve ever seen before,” said Tia Black, whose house overlooks Excelsior Bay. “We’ve got the biggest rink nature ever made,” said Bill Wenmark of Victoria, an outdoor-sports enthusiast and coach. Observers estimated that hundreds of people were out on the lake over the weekend, including families, groups of hockey players and individuals whose skating skills were a bit rusty but couldn’t pass up the chance to use them on Minnetonka. It’s one of the best seasons in memory for skating on smooth, snow-free ice. This is Lake Minnetonka north of Excelsior. Lake Minnetonka has been skateable before, usually in the late fall or early winter before much snow falls. But longtime residents say this year’s conditions are the best they can remember. “In some spots you could look down at it and see your reflection,” said John Gilbertson, who lives in Waconia and grew up in Excelsior. Nevertheless, the Hennepin County Sheriff’s Office advises people to be careful. Lake ice should never be considered entirely safe, said Sgt. Rick Waldon of the office’s Water Patrol Unit in Spring Park. Ice that appears uniform on the surface may actually vary widely in thickness. The smooth ice is good news for the North American Pond Hockey Championship, scheduled for Thursday through Sunday in Excelsior Bay near Maynards restaurant. The tournament has been canceled a couple times in the past due to bad ice, but that shouldn’t be a problem this year. This season’s snow scarcity (11 inches compared to the 27-inch average by now), combined with a lot of above-freezing days, has kept lake surfaces clear and smooth, said Mike Griesinger, a meteorologist at the National Weather Service office in Chanhassen. When warm afternoons melt the top layer of ice, water flows over rough spots and into low areas and refreezes at night as a glossy surface, Griesinger said. Rain in late December “was like a Zamboni, putting on another layer of beautiful ice,” Wenmark said. It’s so smooth that you have to be careful when shooting a hockey puck, he said; without any boards, the puck could travel far out to the middle of the lake. No snow is forecast in the near future, Griesinger said, so the rink could be available for a while. Tom Schlaerth, manager of Hanus Sports in Minnetonka, said his shop rented 50 to 60 pairs of skates last weekend to people planning to use them on the lake. Back Channel Brewing in Spring Park posted a photo of a beer alongside some skates on social media and was busy serving to skaters all weekend, said co-owner Melissa Leddy. Jillian McGary skated with her husband and two children, ages 6 and 8, from Deephaven, where they live, to Excelsior to eat dinner and see the movie “Mary Poppins Returns.” They also skated home from the kids’ school and have made five trips on skates to Big Island, where they saw eagles building a nest. Suzanne Pohle of Wayzata said she saw children out skating Saturday and thought about how they might never forget the time the lake was covered with shiny ice. “I felt it was a day that would make memories,” she said. Current ice thickness ranges from about 13 inches in some areas to open water in others, and about 4 inches is considered safe for a human on foot, said Waldon, of the Water Patrol Unit. People should be especially cautious near lake channels, where currents can hinder ice formation, and around pressure ridges, where colliding sheets of ice can open a crack. Waldon recommends that people wear life jackets and carry a set of rescue claws — nail-like objects that people who fall through the ice can use to get out. Never go on the ice alone, Waldon said, and let someone know where you’ll be and when you plan to return. If you do break through, don’t panic, he said; turn around and exit at the spot where you came from, call 911 and seek a warm, dry shelter. Lynn Pauly of Excelsior skated more than 5 miles from Excelsior out to Big Island and back on Tuesday. Excelsior Bay was quieter on Tuesday afternoon, but Lynn Pauly of Excelsior skated out to Big Island and back, a 5.5-mile journey. She had bought new skates the previous day just for the occasion. “I don’t know when this is going to happen again,” she said.